GES is a construction company specialized in renewable energy with global experience. The company offers full EPC services. GES has constructed more than 14,000 MW of wind energy all around the world. The company covers all activities needed to accomplish the complete BOP, going with the customer through the whole value chain. 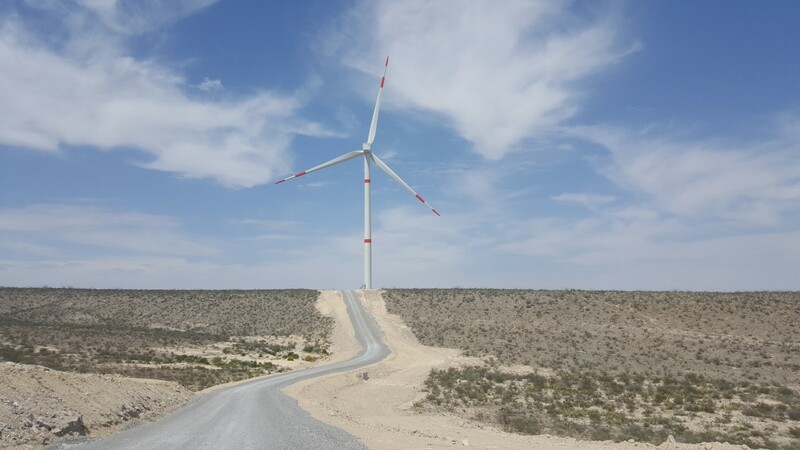 GES is involved in the project from the very first stages, developing the basic and detailed engineering and the associated infrastructures, both for the wind farm and substation. The company develops implications and execution plans. In the construction phase, GES caries out the civil and electrical works, as well as the substation and high voltage grid. The company’s customers include the main turbine manufacturers, utilities, Independent Power Producers (IPPs), developers and investors. 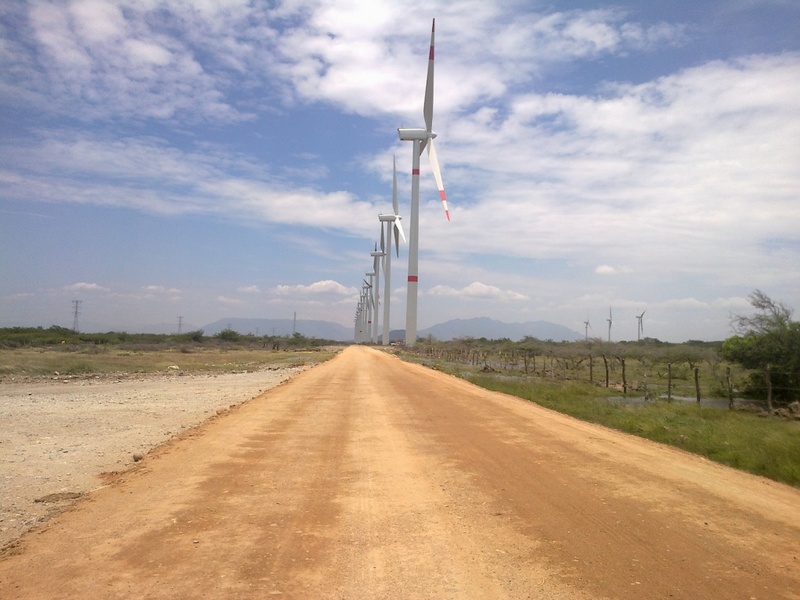 GES has a wide experience in executing all civil works involved in a complete construction of a wind farm (roads, platforms, foundations, médium voltage trenches, and substations). The execution team ensures all works are executing following the internal procedures of the company, ensuring the highest H&S and Quality standards for the industry, all over the world. 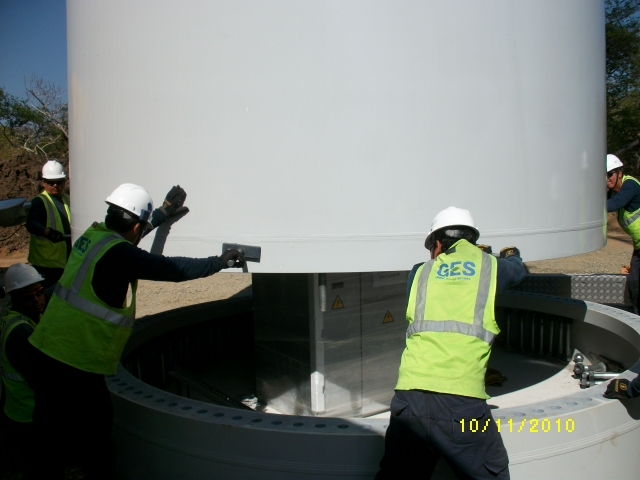 GES supplies the installation and commissions all electrical equipment needed for a wind farm, as well as for a substation (switches, measure equipment, transformers, médium a low voltage, protections…). GES can also provide the médium and high voltage of the wind farm. The project was executed during the Winter, a very rainy season in Galicia. The wind farm is surrounded by many small towns. The works were made under big archeological restrictions, more than 31 cataloged archeological remains. The works should coexist with the penguins of the Sant James Way, one of the paths goes from Finisterre to Muxia. The execution should care about private property. More than 1500 landowners and 400.000 m2 of wood cutting and its corresponding wood management, should be coordinated. A conscious selection of the best materials for the project execution. Transport logistic management for the support of external personnel to firm the roads in any weather condition. The project management was sensitive to the inhabitants of the área. A multiskilled team from Galicia and with a wide experience in this kind of rural environment. Awareness and information to the whole team about the location and restriction of the archeological remains. Daily coordination with the archeological team. There was a person exclusively dedicated to attend the more than 1500 landowners in the field. Cooperation to try to affect as less landowner as possible. Thanks to a local team with more than 15 years of experiences in Galician wind farms, aware of the local peculiarities the project could be executed in harmony with the community without significant claims. The team knew the weather conditions that could be expected during the Galician Winter and the material performance under that conditions, which made it possible to take the correct decisions to commit the works on time, despite the fact that the Winter was the rainiest one registered. It was a big project which includes: permits processing, geotechnical investigation, civil works, substation and control building, engineering, power line, assembly and commissioning. The deadline was very tight due to a delay on hte the foundations design. Winter weather conditions complicated the usual rhythm of civil works. An increase of resources has been implemented in order to reach the deadline, which was extended due the delay of the final design of foundations. H&S measurements following GES standards were applied, to reach a safe work site and to prevent any interference to the local population. GES collaborated to maintain a friendly relation with the land owners and the community, helping them with the tools and resources on site and trying to minimize the impact of the project. Continuous interface between GES staff on site, GES engineering department in Spain and the Client in Chile and in Ireland. The result in terms of quality and schedule compliance was excellent. Continuous improvement in H&S issues along the Project, reflected in the good results obtained in the audits done by the Client. All fo this helped to increase of GES notoriety in Chile, a growing market at that time. One of the main issues in the project was the "chusca" in this region ground, a fine sand which must be mitigated with water to comliance with the enviromental regulation of the area. Water must be carry on from Calama, the nearest city. Weather conditions made it dificult for the concret to harder. GES was in charge of the construction from the work area facilities for all suppliers working in the plant. To avoid the chusca inconveniences, the ground was stabilized with quarry material. To compliance the project schedule, GES needed to install two work plants, to have an extra time for the harder of the concret. Electric installation of the working facilities was made with an hybrid system: 3 mini-wind turbines form 1 kW and 44 solar panels from 300 W/ each, with a capacity of 13,5 kW. termal solar power was used for the water. This was the first time an installation alike was installed in a temporary construction. Despite all the issues and the bad weather conditions during the execution, the project was completed in time applying GES Quality and Health and Safety standards. Strong and consistent winds meant that the assembly of the wind turbine components would be particularly challenging. In order to build a good working rapport with local staff, a clear understanding of the indigenous culture was vital. Due to its terrain, its isolation and its social mix, this area of Mexico is a notoriously difficult environment to work in, and many civil engineering projects are subject to long delays. In order to meet the tight timescales, we completed much of the assembly at nighttime when the strong winds die down. We worked particularly hard to learn about this region of Mexico – in order to understand the local culture and the outlook of the indigenous populations. We gradually introduced the local staff to the project, and worked particularly closely with local technicians – in order to successfully transfer our own knowledge and skills. We worked hard on building collaboriation and rapport across the extended team, and ensured that they could call upon the right level of resource. Due to the speed and efficiency of our assembly processes, we were able to complete the project more quickly than had been anticipated – which led to a substantial saving in the cost of the crane rental. Also, the project was completed without any accidents. And the wind farm can now be relied upon to deliver more than 4,000 wind hours each year.